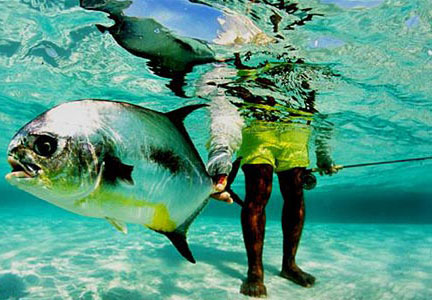 We’ve put up a couple of report type posts on the fishing around Turneffe Atoll this week. Since Belize is a great summer fishing destination and there are some great special fishing rates at 5 of the best fishing operations in Belize, we thought we’d get those special rates all posted in one place. Click on the links below to visit each destinations web page or call (800-628-1447) / email (info@angleradventures.com) for more information or to confirm your reservation. You can do this and get a discount! The cost for 7-nights/6-days fishing is $2,859.72 per person based on double occupancy accommodations and a shared boat / guide. The regular rate is $3,384 per person. The cost for 7-nights/6-days fishing is $2,587.50 per person based on double occupancy accommodations and a shared boat / guide. The regular rate is $2,868.75 per person. The cost for 7-nights/6-days fishing is $2,412 per person based on double occupancy accommodations and a shared boat / guide. The regular rate is $3,668 per person. The cost for 7-nights/6-days fishing is $2,595 per person based on double occupancy accommodations and a shared boat / guide. The regular rate is $3,474 per person. The cost for 7-nights/6-days fishing is $1,999 per person based on double occupancy accommodations and a shared boat / guide. The regular rate is $2,890 per person. The following recap of Angler Adventures owner Chip Bates’ trip to Turneffe Flats Resort appeared as a newsletter in September 2010. Kevin Sheehan’s recent report got us excited about the summer tarpon fishing on Turneffe Atoll as the numbers of large, migratory tarpon rapidly increase over the next few months. Enjoy! My son Tyler wanted to catch a big Tarpon on a fly and I wanted to wade flats for Bonefish and Permit in case the Tarpon weren’t “on”. We had a week in August between Tyler’s summer job and school. The Turneffe Islands have a migratory population of big Tarpon that usually arrive in May and remain through most of October. 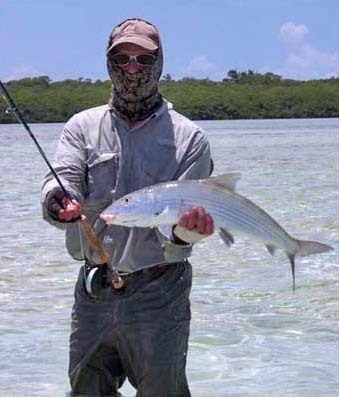 Bonefish and Permit are year round. On paper, it appeared that that Turneffe Flats Resort had what we were looking for. In reality, it was better than expected. First, it’s great bonding to travel with your son. Because of his work and college schedule, we hadn’t done this since high school. Secondly, Tyler and I love the fishing lodge schedule: up early, eat, fish, eat, and to bed early. Well, that’s where we differ…at least I was in bed early. We were assigned Dubs as our guide. Dubs is an upbeat, happy guy who takes his fishing seriously. The only disappointment of the trip was that neither of us landed a Permit. Not for lack of trying. We had multiple, if not dozens, of shots daily. We’ll save the Permit for another trip. We warmed up on Bonefish and caught plenty. Turneffe Flats has some of the best wading anywhere, but we also poled some deeper flats for larger fish and caught bones up to 8 lbs. To me this was a delightful way to fill in the gaps between Tarpon and Permit. One afternoon about 3:00 PM, Dubs suggested the tide was good for Tarpon. We motored back to a large creek, adjacent to the lodge, that connects the ocean to the lagoon. This creek is too deep to pole, but it’s crystal clear. As we approached the creek, Tyler spotted something break the surface at a distance. We stopped and looked but could confirm nothing. We continued towards Dubs’ favorite Tarpon spot. Dubs dropped anchor and asked Tyler to cast his intermediate line perpendicular to the current, let the fly sink, then swing in the current on the retrieve. While Tyler was straightening his line, Dubs saw activity in the area we’d just come from. Next we saw two 100 lb Tarpon come completely airborne like dolphins at Sea World. Holy #$*@!, we all said in unison. Up came the anchor and we got our butts to that spot in a hurry. For the next 45 minutes it was mayhem. Big Tarpon everywhere around the boat, under the boat, airborne on both sides of the boat, all chasing big needlefish and ballyhoo. It was one of the most incredible sights I’ve seen in lifelong fishing career. 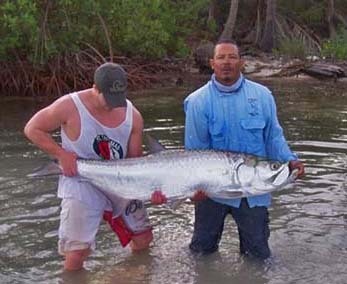 Bottom line: Tyler jumped 4 tarpon from 80 – 120 lbs. Every fish eventually threw the fly. The frenzy petered out just before dark. Time for dinner. Dubs said the tide would be good again in the morning. He wanted to be on water before sunrise. We got to Dubs’ favorite spot in the pre-dawn light. It was beautifully quiet and calm, except for the tide. Tyler straightened his line, ready to cast the black and purple Puglisi Tarpon Streamer tied on a circle hook, the same fly the 4 tarpon ate the day before. It wasn’t long before we saw Tarpon roll in the current left of the boat. One cast and Tyler was dancing with a tail walking Tarpon that again spit the fly. Not being a fan of circle hooks, I suggested to Dubs that we change the fly. We selected the exact same pattern tied on an Owner Aki traditional bend hook. Tarpon remained active around the boat and it wasn’t long before Ty connected again. This time the fly held through the first jump, the second and third jumps. 30 minutes later we landed this gorgeous fish, estimated at 80 lbs. The Tarpon had stopped rolling. We were back in time for breakfast, ready to sight fish for bones and permit the rest of the day.